While most people might think of a fragrance named Chinatown being something like a spicy incense–this is actually a fruity floral. And it’s a beautiful fruity floral at that. In Bottle: Sweet peach and tuberose with a bit of cardamom spice added in. Applied: One of the few fragrances, in my books, that does a sweet peach note well. It’s sweet but not to the point of candy. It settles the peach in fruity territory and dishes into the mid-stage rather quickly. There’s supposed to be bergamot up top but I got very little of it in the opening. Maybe a dash, a couple of dewy drops. Not a whole lot of citrus in this one to go around as there’s more cardamom with its spicy–call me crazy–slightly earthy quality in this fragrance. The mid-stage is marked with my friend tuberose and the lingering cardamom. A bit tame and sweet and heady, the tuberose drowns out whatever other flowers might be in this mid-stage. Lucky for me, I love tuberose and despite her being the dominant floral, she isn’t as loud here as she is in Fracas, for instance. Now my favorite white flower with the big personality does settle down a bit, letting hints of orange blossom and honeyed vanilla seep through with a rather pleasant drydown of warm spicy cardamom and woods. Extra: Chinatown was composed by Aurelien Guichard. It’s one of my favorite fruity floral fragrances for its marriage of fruits, florals with an added kick of spice. There’s different versions of it too, including one limited edition bottle that’s $650USD. Design: Chinatown’s bottle shape is similar to that of other Bond No.9 bottles. The star shape is growing on me, though I still think it looks a little silly. I do love Chinatown’s design of a pink background splashed with a white be-flowered branch. Notes: Bergamot, peach blossom, gardenia, honey, tuberose, peony, orange blossom, patchouli, cedar, vanilla, sandalwood, cardamom, Guiac wood. I had the same problem opening my sample vial of Chinatown as I did with other Bond No.9 sample vials. They do something amazing to vacuum seal this stuff in or something because I just can’t get a grip. Regardless, Chinatown is a beautiful fruity floral and one of the more lovely renditions of the fragrance genre. If you’re looking high-end and not finding the fruity florals that you love, then give this stuff a whiff–if you can get the sample vial open, that is. 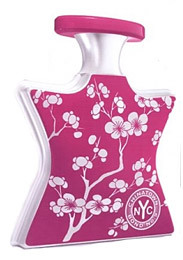 Reviewed in This Post: Chinatown, 2010, Eau de Parfum. This entry was posted in bond no.9, floral, fruity, Reviews By House and tagged bergamot, cardamom, cedar, gardenia, Guiac wood, honey, orange blossom, patchouli, peach blossom, peony, sandalwood, tuberose, vanilla. Bookmark the permalink.